BGW, BSR, EBL, ISU and now NJF.. Honestly, if you look at the list of airports in Iraq which welcome flights from international destination you’d think we are already listed as a top ten destination on CN Traveller. Iraq has a total of 12 ‘airports’ .. they really were all military landing strips turned ‘civlian’ sometime in the 80’s and 90’s. And now they’re being opened to international flights. 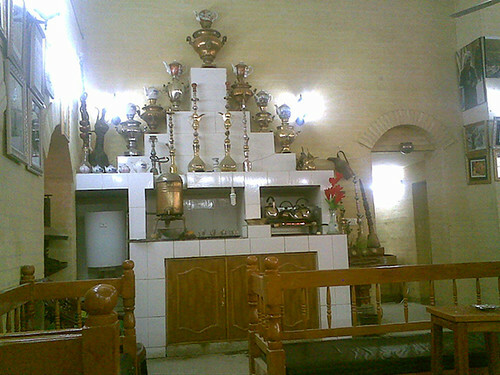 The latest addition was the airport in Najaf city. This has been slated for development for a very long time. Najaf is a very important holy city for Shia Muslims, pilgrims are expected to come from as far as India and Pakistan. This week it has seen its first test as pilgrims arrive for the commemoration of Arbaeen al-Hussein which marks the end of the mourning period for Imam Hussein the grandson of the prophet Mohammed. A recent press release said that the Najaf airport is expecting 40, yes four zero, flights to arrive over the week’s period carrying travellers for this Monday’s celebrations. And two days ago it received a whopping 1300 travellers in one day. You might scoff but when you see what it actually is you’ll know why they’re excited.. it’s practically a shed beside a 3km strip in the middle of the desert (GMaps link, make sure you have the sat view turned on). Maliki to Biden: There is a new bully in town, it’s me. Reuters: Iraq’s Maliki says Biden criticism “out of date”. But nothing much has happened to resolve the disputes between Kurdish and Arab factions in Kirkuk. Maliki just doesn’t want to be pushed into action by the US. Near Babylon? Wondering where to park your tank? Oh and the US Embassy is donating $700,000 towards the restoration of the site… *sigh*. The beautiful Madrasah (al-Madrasah al-Mustansiriya) on the Tigris in central Baghdad looks like it has miraculously escaped all the madness and chaos around it and still is the serene quiet space it always was. It is still there, and it looks like nothing has touched it. 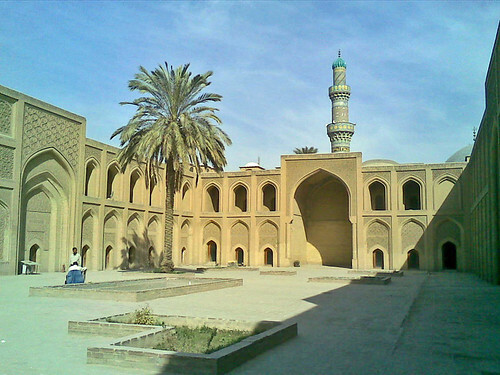 It’s my favourite quiet space in Baghdad… An awesome building. Simple and modest from the outside but once you’re in the main court it will spin your head with all the beautiful geometric patterns on every wall. But instead of the dizzyingly colourful patterns you might see in the beautiful mosques of, say, Isfahan. This building is monochrome. It’s all done in brick, all the colour of dust. If you want to zone out nothing will distract you and if you want to get lost in intricacies you just move closer to one of the walls and start following lines on walls. And magically, it is all still there. And just like before once you go through the door all the hustle and bustle of the market just outside is gone and all is quiet. I was greeted by two uniformed men on the door this time. I was worried that they might not allow me to take photos. Last time I was here I wasn’t even allowed to go in. But no, one of the guards actually asked me why wasn’t I taking pictures.. and do I want to go upstairs and see the upper rooms? And then he left me and went back to his friend. 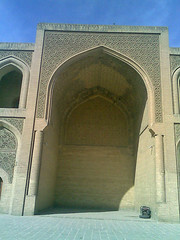 I spent an hour there, and just like before it was as if the Madrasah is mine alone. Hurrah, elections are over. Not much of a whoopee, but good nonetheless. We’re still waiting for the final results of the elections. And there is still a lot to be worked out. The way the results were announced a couple of days ago was a bit confusing. First they didn’t tell us much about how the local councils will look like. Depending on the number of voters and the population of a province a list (or bloc) will get a seat with only 3% of votes while in others it will take as much as 5% to get one seat on the council. Then there is the matter of the 600k or more people who voted on the ‘special vote’ day. Those were soldiers, policemen, people in hospitals and prisons who were allowed to vote a day ahead of the elections. The Electoral Commission says they ran out of ballots on the day. Which probably means that a very high percentage of the 600,000 people voted. And that is as big an electorate as a small province. But we can still see who the biggest loser is: The Supreme Council of the Islamic Revolution. Even with this super impressive name they seem to have pissed off enough people in the last year for the electorate to decide to punish them. The biggest winner: Al-Maliki. If there was even a night in which our PM should have gone out and gotten seriously drunk it was the night the preliminary results were announced. In 10 out of 14 provinces his bloc came out on top and in two of Iraq’s biggest provinces, Baghdad and Basra, his bloc will get the majority of seats on the councils. (Al Maliki doesn’t drink, so I got drunk for him, any excuse for a binge eh!). My worry is that this is a man who until recently was accused of sectarianism and heavy handed politics. It wasn’t until the SOFA negotiations that he read the shift in the national mood and went for the whole non-sectarian national politics, even moving away from the idea of regional governments back to a unified Iraq with a central government. So let’s hope he actually has changed and it wasn’t just a bit of political opportunism… actually now that I’ve written that it sounds too naïve.. It probably is. Ho hum, we’ll see. And if it all goes wrong we get to punish them politicians again in the elections coming up at the end of the year. It’s being renamed (rebranded?) 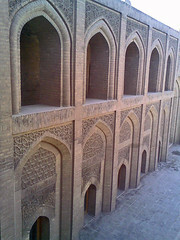 as Baghdad Central Prison! Sunni Side Down? .. I think not. I love the Daily Dish, I am a loyal follower but, Andrew, not even the numbers Musings on Iraq quote support that argument. Not only have more people voted in each of the Sunni provinces this year but Salah al-Din has the highest voter turn out in Iraq, more than 10% above the national average. Here on the ground the sense was that the Sunnis in those four governorates are going to be voting enthusiastically not only because Sunni extremists made participation in the elections a deadly proposition but also because they haven’t participated in the last elections which turned out to be quite a disappointment for Iraqis – probably one of the main reasons why the voter turn out in Iraq was less than the vote in 2005. Also, it was widely broadcast and told on the day of the vote that the Sunni Brotherhood and other militant Sunni factions were not only encouraging voters in Sunni provinces to participate but they said they’re putting their weapons down for the day. Sunni groups _ that boycotted provincial balloting four years ago _ were deeply involved in this election, anxious to claim a share of power they had given away to Shiites and Kurds. What is very remarkable this time is the fact that voters in those heavily Sunni provinces might have turned their back on the obvious Sunni choice, The Iraqi Islamic Party, and gone for more centrist options. As Musings on Iraq says the results won’t be known for weeks but the initial indications are that the Islamic Party and its associates have lost a lot of ground to other, less fundamentalist parties. Juan Cole’s Informed Comment has a very interesting post in this regard. I think the post on Musings on Iraq is diminishing what Iraq’s Sunnis might have done this time around. They didn’t only come out to participate in the democratic process in big numbers but more importantly shunning fundamentalism in favour of more centrist parties. And I hope that Andrew Sullivan takes another look at the numbers and see that saying ‘Sunnis didn’t show up in convincing numbers’ just ain’t fair. 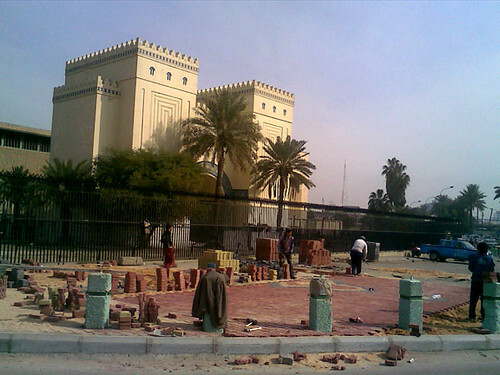 Iraqi National Museum.. opening soon? 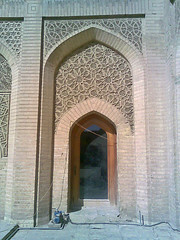 museum, originally uploaded by salam pax. Took this photo a couple of days ago.. It’s the main entrance to the Iraqi National Museum, in case you didn’t recognize it. The last I heard was that the National Museum should be open for the public sometime in February.. at the moment there is a lot of activity around it. Hopefully this is a sign that it will open soon. 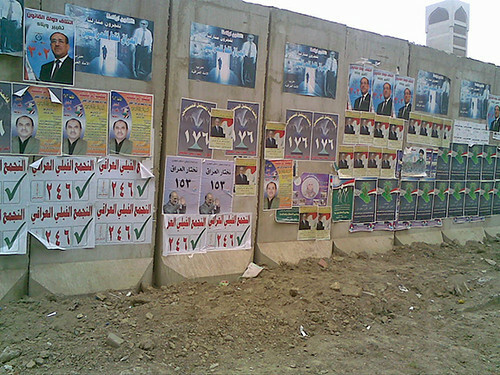 – Candidates up for election Iraq-wide: 14,428… yes you read that’s fourteen thousand, four hundred and twenty eight! Either they we’ve all really really embraced democracy or they don’t know what the job is about and they think it’s just easy money). – Number of seats on Baghdad’s Council: 57 (41.6 per wannabe ‘council member’ per seat.. there will be tears.. a lot of tears). – Number of provinces voting in this election: 14 – Kurdistan doesn’t want to as it’s a region and Kirkuk… ahh poor Kirkuk… too many fighting factions over that oil rich province.. no one know what to do.. not even Joe Biden. Nightly News video : Iraq’s ‘Torture Museum’ shows off Saddam’s crimes. first two notes on the report itself..
1. After all these years of US presence here would FRIGGIN stop prnouncing the name of my country as ‘AI RAK’… it’s ‘EEEERAK’… and this applies to Iran as well… please. 2. Why on earth do US news channels get access to this when we haven’t heard about it at all in Iraq? It seems there is a new musuem in Baghdad… a ‘torture musem’. Not really looking forward to that opening.. would rather hear when the Iraqi National Museum will be opening its door to the public. From the video it almost looks lilke this ‘torture musem’ is being put together from things the US governemnt has given back to the Iraqis.. one metal pole from which people were hung has an FBI sticker on it and boxes have ‘Saddam’ written on them in English.. another gift from the US governemnt? oh and the hole in which Saddam was found is being ‘replicated’! Hurrah! Anyway.. I won’t be visiting.. too macabre. But I am looking forward to the documents the reporter said are going to be put online by the museum. That will be worth taking a look at. The Associated Press: Iraq won’t allow Blackwater to operate in country. 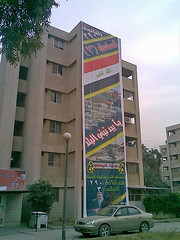 Blackwater’s image in Iraq was irrevocably tarnished by the September 2007 killing of 17 Iraqi civilians in Nisoor Square. Five former Blackwater guards pleaded not guilty Jan. 6 in federal court in Washington to manslaughter and gun charges in that shooting. I think this is the first time SOFA is bearing its teeth at the US governemnt. The new US-Iraqi security agreement gives the Iraqi government the right to licence (or not) any security firm working within its borders. And Blackwater, after behaving like it’s a free shooting range here, have angered a lot of Iraqis… example of their stupidity? Federal prosecutors in Seattle intend to charge a former Blackwater USA operative for fatally shooting the bodyguard of the Iraqi vice president after a drunken Christmas party in Baghdad’s secure “Green Zone” in 2006, according to the man’s attorney and sources within the U.S. Department of Justice. shahbandar2, originally uploaded by salam pax. 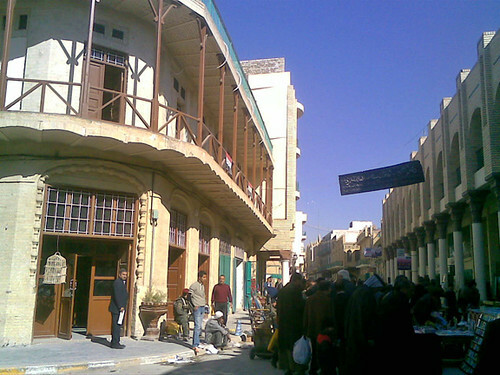 As you walk into the famous Baghdadi book market.. al-Mutanabi street you’ll see a tea house right in front of you.. it’s on the corner. That’s my new favourite spot. Every night before going to sleep we turn on the water tap in the kitchen, put a metal pot upside down under it and keep the kitchen door open. This, my dear friends, is the best way to wake up when you finally get running water in the middle of the night. The moment you hear that clang of water over the pot you get up immediately and start filling everything you have in the house that will hold water. If you’re lucky you’ll fill all your tubs, tanks and jugs before the tap runs dry again. One of the first things we had to do after walking into the flat we’ve left for two years is buy two cylindrical water tanks with little spouts at the bottom. They stand as tall as an adult in the corner of the bathroom and the kitchen. There is another smaller tank by the shower and many jerry cans as well. So… you sorted out the water. Next task, electricity. I can’t remember the last time we had electricity from the national grid for a full 24 hours. Even before the war we had an electricity rationing schedule but after the war the system just fell apart. Days and days would go by without any electricity. What do you do when the government can’t provide electricity? You find private power-generator owners and buy your power from them. Running multiple power generators and selling electricity is good business here in Iraq. In the building we live in there is even a waiting list for new subscribers. The electricity-generator man is king. “The generator will rest twice a day”, “the generator will need repairs”, “the generator heats up and must be shut down”. The endless demands of this man are never disputed. And his services don’t come cheap either. We pay 10,000 Iraqi dinars – that’s 12 US dollars – per ampere. At the moment we buy 5 amperes.. that’s 60 dollars a month on top of the bill we get for using the little electricity from the national grid. With 5 amperes we can keep the refrigerator running, turn on the tv and for light we had to install energy saving bulbs every where.. regular filament burning lights are electricity drains. We all look a bit paler at night but at least there is light. And if we need hot water the refrigerator and the tv have to be turned off. The boiler doesn’t like sharing the 5 amperes we get. When the electricity makes one of its rare visits once or twice a day everyone in the house runs around doing things that can’t be done on a generator. Washing machines, vacuum cleaners are turned on and every portable light that needs charging is plugged in. Then cross your fingers and hope the electricity stays long enough for your washing machine to run a full cycle. The one government provided service that has seen significant improvement is the supply of fuel and oil products. The days of long queues in front of gas stations to buy cooker gas and heating fuel are gone. Refineries are producing enough fuel products to cover most demand and an increase in price made stealing and smuggling oil across the border to Iran less lucrative. I don’t want you to think I’m complaining, well, I am but just a little bit. After an illness you don’t recover just like that.. your health comes back in stages and Iraq has been very ill for a long time. We are seeing the first signs of recovery with the improved security situation and I believe all Iraqis can be a little bit patient as long as the positive signs continue. We’ll keep paying the power generator guy his monthly fees for a bit longer.. I just hope the government doesn’t take too long to get things back up and running.. summer with it’s 50 degrees heat is just a couple of months away. Wondering what your favourite Ayatullah thinks about the elections? I am loving al Sistani’s full embrace of the Interwebs. Yesterday our favourite Ayatullah al-Sistani updated his website (a sort of Fatwa blog really) to share with us – his devout followers – some thoughts on the coming provincial elections. Unfortunately for you non-arabic speaking peeps you won’t be able to drink from this endless cup of wisdom. “ sure, why not…it’s cool bro”. Unlike the previous national elections where voting was deemed almost a religious duty this time the official line is that Sistani encourages all faithful to vote even though the previous elections might not have been fully satisfactory. The statement also says that the Ayatullah is keeping an equal distance from all candidates and is not endorsing anyone. What is interesting is in his advice for us on how to choose the best candidate to vote for. He doesn’t mention the need for the candidate to be a devout Muslim – shock horror – more important for al-Sistani is the candidate’s honesty and ability to serve the people. He might be a beardy Ayatullah and all but, I tell you, given half a chance al-Sistani can be a cool beardy Ayatullah.